This post was written by Melanie Miller Foster (@GlobalMelanie) and Daniel Foster (@FosterDanielD). This past year, we have had the privilege of working with experienced agricultural educators to share their knowledge, experience and best practices with the world through the “Ag Educators Corner” blog series on Agrilinks. We began our exodus of knowledge with Blaze Currie of Texas, who encouraged us to ask “why” questions in order to intentionally create an environment that promotes student success as the best way to create intentional leadership programs through understanding why our programs matter. As issues such as food security and changing weather patterns loom over us, it is imperative to build grey matter infrastructure to promote innovation and expertise in agricultural disciplines. There is your why. We need youth to be the foundation of that grey matter infrastructure and to be excited and inspired as the next generation of agriculture leaders. That’s why agriculture education programs are simply fundamentally critical to our global long-term success. 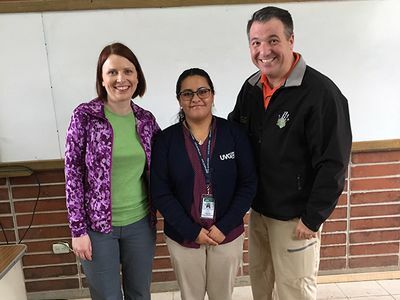 Throughout the year, educators shared their experiences with agriculture education that were meant to inspire involvement, provide a structure for students to explore agriculture, and connect with communities. Below is an overview of what we explored over the past year. Kaylie Ackerley of New York shared with us how we can use authentic problems in the classroom to make agriculture come alive through problem-based learning. Bringing authentic, real world problems into the classroom is a vehicle for allowing students to take responsibility and ownership over their education. As educators, we can design the instruction that results in transformative learning. Madison Taylor of Minnesota shared how special events such as camps can energize and inspire students to become and stay involved with agriculture. One way to inspire future agricultural leaders is to provide hands-on entrepreneurial activities. As educators, we can be one the ones who tell students that they can do it. Matt Eddy of Iowa demonstrated how success can be found using on-site agriculture facilities as learning laboratories to nurture meaningful learning experiences. He shared his experience with the Animal Learning Center, which allows students to explore agriculture through the real-life application of knowledge. As educators, we can seek out partners to remove the barriers of our classrooms. Kevin Cross of Indiana explained how agricultural career exploration can help students identify fulfilling careers in the agriculture industry. Students can explore the wide spectrum of careers in agriculture through summer or after-school employment, field trips, online agricultural career exploration tools and other avenues. As educators, we can provide the gateway to unique work-based learning opportunities. Krista Pontius of Pennsylvania shared how engaging students in agriscience research can interest the next generation in addressing the most pressing problems of the agriculture industry and allows for the exploration of future career pathways that students may not have considered previously. As educators, we can help make explicit the connections between our context of agriculture and academic concepts. Greg Schneider of Indiana discussed how agricultural service learning connects students to local communities. Service learning is a way to combine curricular standards and course objectives with opportunities for students to engage in meaningful learning while meeting community needs. As educators, we can amplify student voices as they realize their own individual agency in cultivating positive change. Matt Kreifels of Nebraska discussed work-based learning as a career development strategy in agriculture. Beyond career awareness activities in the classroom, agricultural educators can help students identify suitable employers in the local community that match their career interest. As educators, we can be a clearinghouse of community partners and student learner needs. Melissa Bonifas of Nebraska rounds out the discussion by sharing the importance of student recognition events, in which the student and community come together to celebrate student success. As educators, we can provide a platform for true exuberant celebration and pride in where we live, work and learn. The above best practices demonstrate the importance of making agriculture an appealing opportunity for young people. Through our work around the world in agriculture education, we see that while students have diverse backgrounds and circumstances, there is a shared humanity. Young people have a strong desire to make themselves useful to the world, earn a living, and create a better future, and it is our job to walk beside them to show the opportunities that agriculture holds. As we continue forth in our journeys, we do hope that you will connect with the Global Teach Ag! Initiative by emailing teachag@psu.edu. It is our dream to connect teachers and students from across the world over a shared interest in agriculture. We strive to improve our own agricultural education practice every day, and we hope that you are inspired to as well. While we indicated the “home states” of the authors above, the fact of the matter is that while we may hail from different states or backgrounds, we are all responsible for the solution for the one planet we have. As educators, we are empowered with an incredible opportunity and power to alter the course of humanity, one student at time. Melanie Miller Foster is an assistant professor of International Agriculture and Daniel Foster is an agricultural teacher educator and associate professor of Agricultural Extension Education at Pennsylvania State University. Melanie and Daniel are enthusiastic team members of the Global Teach Ag! Initiative and the USAID-funded Innovation for Agricultural Training and Education (InnovATE) project. Findings from research on the Honduran education system and Honduran student focus group interviews resulted in some recommendations for building the capacity of agricultural and education training systems.